The KW range of coilovers is one of our biggest selling brands. This superb range of height adjustable suspension offers superb ride and massive ride height adjustment. Most kits will lower a maximum of just over 80mm. The damping is also tuned for optimum handling. We are the UK’s number one dealer for KW suspension components and can offer some amazing prices. A lot of our show cars over the years have been fitted with KW coilover suspension. Build quality and value for money is amazing. All kits are German TUV quality approved and we stock most of the range so delivery times are very quick! 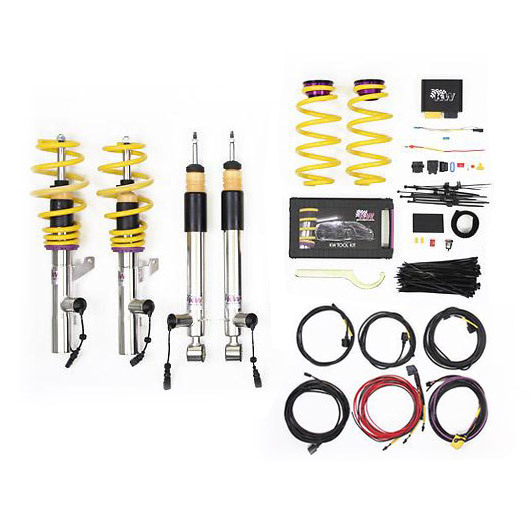 KW DDC Coilover Kit - Adjustable Ride Height, with Electronic Damping Control-The next generation in coilover technology! The KW DDC Coilover Kits are suitable for all VW models NOT fitted with VW’s electronic built in damping adjustment control that you get on some of the newer VW models. For example: New Scirocco, Golf MK6, Passat 3C etc. KW combined the individual ride height adjustability of their renowned KW variant 1 coilover suspension kit with the superb adaptive electronic control that some manufacturer fit as standard. Damping adjustment at the touch of a button! KW Variant 1 DDC coilovers are a straight forward replacement to the factory fitted suspension kit, there is a new ECU supplied, instructions are included in the kit. KW DDC coilovers use the KW "inox-line" Stainless Steel technology. All the tubing and virtually all the welded parts on the coilover units are produced in stainless steel. The completed housings are then polished to give them an outstanding finish, and the shiny surface is much more corrosion resistant compared to conventional finishes. A special thread design coupled with composite spring collars simplifies height adjustment and offers unrivalled durability and resistance to corrosion. The KW suspension units are built to handle the punishing conditions that suspension has to endure, not only from the road, but also from the weather. Note: These units are only suitable for cars that have not been fitted with DCC as standard. It is an aftermarket version of DCC to fit to non-DCC vehicles.